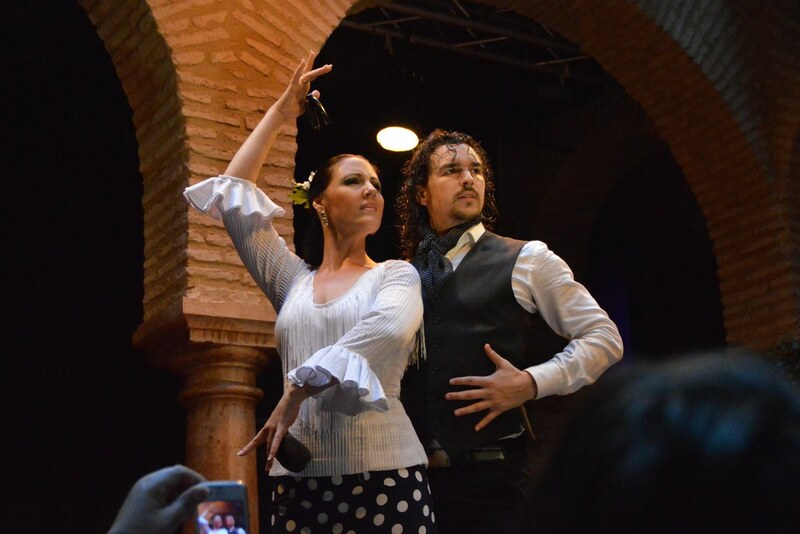 Where To Enjoy Flamenco Art In Seville? Flamenco art can be experienced in different settings apart from the very well known tablaos. Apart from them, Seville offers a wide variety of venues as well as a couple of festivals where you may discover your passion for flamenco. The places listed below are less touristy than the tablaos. Tablaos are a good option as an introduction to flamenco. You’ll see a large group performing a very professional choreography and music, and wearing beautiful dresses (only women, of course). However, if you look for smaller locales and something a little bit off the beaten path, then you should try one of the following options. I’ve listed them from the most obvious to the ones only Sevillanos know and go to. Unfortunately, some are not available throughout the year but if you can make it, don’t think twice! Shows: Every day of the year. 1st show at 19:30, 2nd show at 21:00. Depending on the season, it also organizes shows at 22:30. La Casa de la Memoria is one of the most beautiful places where you can attend a flamenco art show. The location is within the former carriage house of one of Seville’s most well known monuments: the Palacio de Lebrija. The flamenco show takes place in a unique, intimate room not far away from the central patio, very typical of Sevillian traditional houses (e.g. Casa de Pilatos, Palacio de Lebrija). The performance features singing, dancing and guitar playing by a rotation of some of the best flamenco artists from Seville. The place is relatively small so I recommend you to book in advance. Shows: Every day of the year. 1st show from 19:00 to 20:00, 2nd show from 20:45 to 21:45. The Museo del Baile Flamenco was founded by one of the most famous Spanish bailaoras, Cristina Hoyos. She has been dancing since she was 12 years old and started her own dancing company in 1989. Cristina is probably the most awarded flamenco dancer. Visiting the museum is a great experience because it will give you an idea of what flamenco is, know more about its origin and learn its different styles. On top of it, the museum organizes an espectaculo flamenco every day of the year. The show lasts one hour approximately and the list of artists is very long so you can see a different group performing every day. In addition to this, the museum offers the chance to attend to flamenco and sevillanas lessons depending on the season. Shows: Every day of the year. 1st show from 19:00 to 20:00, 2nd show from 20:30 to 21:30. The auditorium is a cultural space where you can enjoy an intimate espectáculo flamenco. It’s located in the basement of a traditional Sevillian house, dating from the 19th century. There are approximately 90 folding chairs where you can seat so it’s a very small and cozy venue. Actually, it might be the smallest flamenco venue of the city! The stage is not really big so there are generally 3 to 5 people performing: a singer, a dancer and a guitar player. It’s something very different from what you can see in other tablaos considerably bigger. However, it doesn’t mean that the quality of the show will not fulfill your expectations. The auditorium is a family run business and the owners have been involved with flamenco art in Seville for many years. Shows: From Wednesday to Saturday. The show starts at 20:30 and ends at 21:30. Is there any place in the world where you can enjoy flamenco more than in Seville? I don’t think so either! Located in Triana, right on the banks of the river Guadalquivir, the Tablao Orillas de Triana offers a great traditional flamenco show. From Wednesday to Saturday two bailaores (man and woman) display their art. Make sure you appreciate the difference between the male and female styles of dancing. Furthermore, the guitarist plays a solo and the singer performs a few songs. At the end, all the musicians play and the artists dance traditional sevillanas and bulerías. Don’t miss the chance to go and enjoy a magical night in Triana! The Bienal de Flamenco is a festival organized by Seville’s City Council every 2 years. It usually takes place between early September and the beginning of October. It’s one of the most important flamenco festivals of the world, if not the main one, and has an excellent reputation. The whole city is devoted to flamenco art during the Bienal and there are performances taking place in theaters, auditoriums and even the Alcázar and a corral de vecinos! Apart from these, you can also go to some of the peñas flamencas and enjoy a great spectacle. Peñas are cultural organizations that usually own a locale or bar where discussion groups or performances take place on a regular basis.